New Burnham Turquoise Bracelet set in a Timeless Design. Gem quality turquoise used in Native American jewelry is a special passion for us here at Twin Rocks Trading Post. We search far and wide for the best in natural Southwest American turquoise as well as fine quality specimens of Persian and Chinese turquoise. Turquoise is identified by the mine it comes from. Twin Rocks’ wide selection of classic American turquoise includes Bisbee, Blue Diamond, Blue Gem, Burnham, Carico Lake, Cripple Creek, Damele, Fox, Kingman, Lone Mountain, Morenci, Number 8, Pilot Mountain, Red Mountain, Royston, Sleeping Beauty, Stenech and Turquoise Mountain. And, we believe in placing turquoise within classic southwestern jewelry settings. 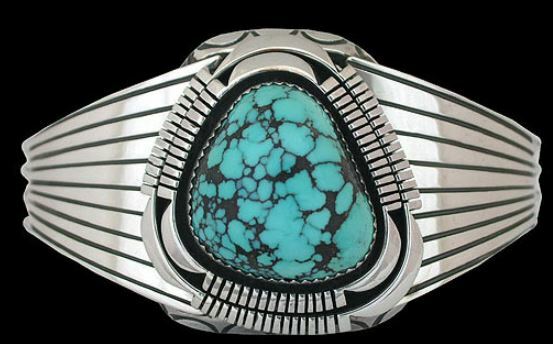 We work with the best Native Southwest silversmiths and goldsmiths, including Will Denetdale, John Begay Jr., John Yazzie, and Eugene Livingston. We love to see their blasts into the past and their experiments that pull us into the future. (We also work with outstanding turquoise bead artists Ray Lovato, John Huntress, Bruce Eckhardt and Kai Gallagher.) Our goal is to offer true Native American turquoise craftsmanship in individually designed jewelry treasures. If you are looking for unique, high-quality turquoise bracelets, earrings, rings, pendants, necklaces and other beautiful objects crafted in sterling silver and 14k gold, look no further. You will not find a better selection anywhere in the Southwest — that is our promise and our guarantee to you. While exploring the Southwest, seek out one of the best-kept secrets in the United States: Bluff, UT, and Twin Rocks Trading Post and Gallery. For decades we have built loyal clients, and we all benefit from our strong relationships with local artists. When you visit, stop by the cafe and put your feet up. Enjoy the Bluffs. Talk to the locals. Then come down to the Trading Post and Gallery. Feel the passion of the turquoise, and the love that goes into creating one of the finest collections of Native American arts and crafts. It’s all about the beauty! Ellen Meloy, Bluff’s Favorite Local Writer — We Miss You. Author Ellen Meloy lived in Bluff, and she left the earth far too early. She captured our home here as few other writers have. And so, why use our words, when we can give you hers about this, our desert home. When travelers come into Twin Rocks, they often ask us directions, the history of the land, about Navajo people. They want to know how we can live here, the epicenter of nowhere and everywhere. We should simply print out Ellen’s words and hand them out to our guests. We could also say that her advice works just as well if you live in New York or L.A. You are still part of the natural world, and it makes sense to know your heart’s address, no matter where you live. Come visit us at Twin Rocks. Read one of Ellen’s books. Understand that when you come here, you, too, will see eternity. What a blessiing, Ellen. Thank you for your words. The Crew at Twin Rocks. Most people around the world hold the story of the Great Flood as part of their basic belief system. And, every tribe’s story is somewhat similar to our own tribe’s story of the Great Flood told in the Bible. Water, in the legends, is a primary world, a preworld, a world that gives birth to the present one. Through the energy of water, man is forced or driven to rise to a higher plane. In many origin stories, The People are (as in the Biblical tale) indifferent to their plight, and thus only the worthy, the “listeners” — men, animals, birds, and insects — are brought up into the next world. The Great Flood, as known the world around, is a purifier which illustrates that the earth’s creatures are out of balance. In the Creek Indian legend, The People fish from their housetops until they are drowned. Later, they are turned into mosquitoes. The Navajo version shows how Coyote stole two Water Monster babies and brought on the flood by stealing from the Water Monster mother. Water, in all of the stories, is a complement to Fire, a mysterious power that must be understood in order to be used properly. Luana Tso, magnificent weaver, presents her own interpretation of the Hero Twin known to us mortals as Monster Slayer. 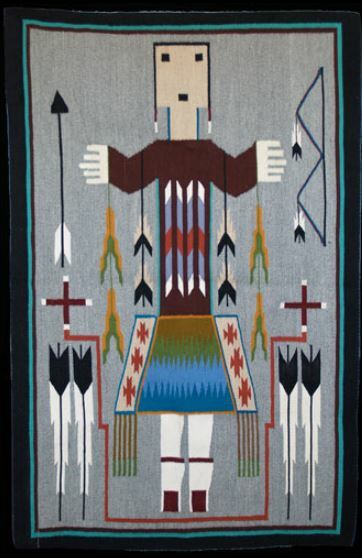 With his brother, Born-for-Water, this brave warrior became a hero in legend to the Navajo. Directed by their father, the Sun Bearer, and with some very nasty implements of war, the boys purged the most dastardly beasts to extinction. No wonder this bad-boy-hero-of-the-desert inspired the mellow weaver, Luana. Might there be more untapped emotion beneath her tranquil surface than we guess? We would say a large YES!, and we can’t wait to see what Simpson weaving Luana conjures up next on her loom! 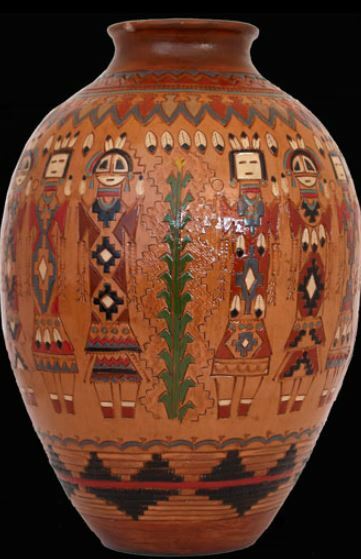 Navajos have many forms of protection from people, events, and spooky beings. So, we at Twin Rocks, thought we’d start sharing a few tips with you, and show you art that’s been created to boost the protective energy. The word “ambush” has a pretty interesting beginning. The word itself is an old word that means a shelter that’s formed by two trees or shrubs whose branches intermingle. Thus, it’s a good place to lay in ambush for someone, or to keep from being ambushed. This leafy ambush is a setting that occurs repeatedly in myth. And, from the ambush, people have learned or invented protective rituals including herbal magic, frames, hoops, pokers, prayersticks, and pieces of carved wood. A hero, hoping to shoot a ram or other animal that he did not recognize as a god, lay behind the ‘ambush trees.’ When the animal appeared, the hero was numb until it had passed. If the animal turned out to be a god, it would reveal himself as a deity to the hero. Then, the god would begin to teach the hero ceremonial lore and wisdom. In the once-were-coyote episodes, the intertwined trees become a shelter for the hapless hero who was bewitched into becoming a coyote. The ceremony, or chant, to cure this is called Hoops of the Night Chant. The hoops are made of the ambush woods, which appear again in the pit-baking, and they’re associated with the wood samples of a healing herb. In this remarkable basket woven by Jonathan Black, the rams offer protection from deities who might be waiting to ambush an unsuspecting person. Thank you, beautiful rams! Tony Hillerman loved the four corners area, and we’re proud that this gracious and artistic man graced Bluff with his presence while researching A Thief of Time. As always, Tony’s books are filled with Navajo lore, and they are spell-binding. At a moonlit Indian ruin—-where “thieves of time” ravage sacred ground in the name of profit—-a noted anthropologist vanishes while on the verge of making a startling, history-altering discovery. At an ancient burial site, amid stolen goods and desecrated bones, two corpses are discovered, shot by bullets fitting the gun of the missing scientist. Modern mysteries abound in ancient places, and Navajo Tribal Policemen Lt. Joe Leaphorn and Officer Jim Chee must plunge into the past to unearth the astonishing truth behind a mystifying series of horrific murders. 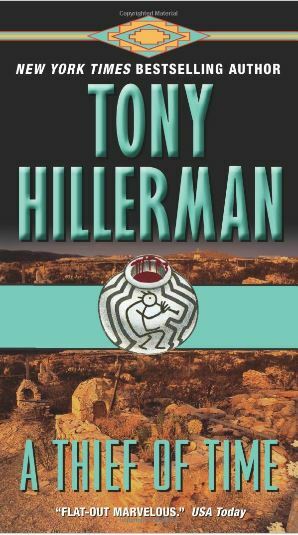 Tony Hillerman was the former president of the Mystery Writers of America and received its Edgar® and Grand Master awards. His other honors include the Center for the American Indian’s Ambassador Award, the Silver Spur Award for the best novel set in the West, and the Navajo Tribe’s Special Friend Award. He lived with his family in Albuquerque, New Mexico. 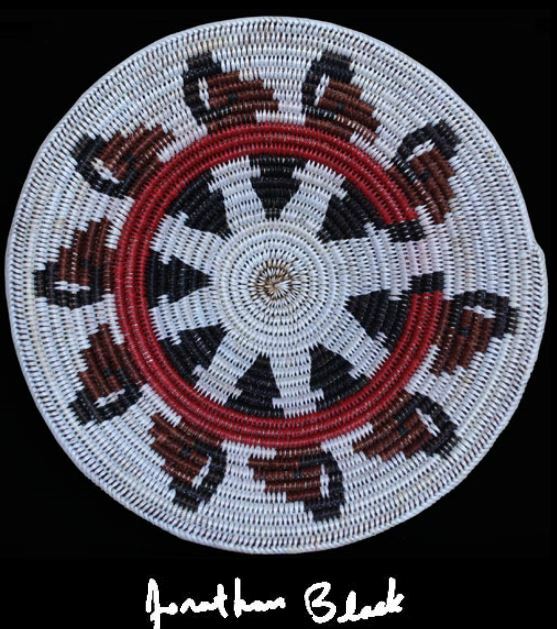 At Twin Rocks, we feel that Alicia Nelson had her head in the beautiful clouds while weaving this basket. The Navajo Sky World is often represented by cloud symbols, and it is considered an enchanted place where deities dwell. The world is a place of intense beauty, majesty and harmony. 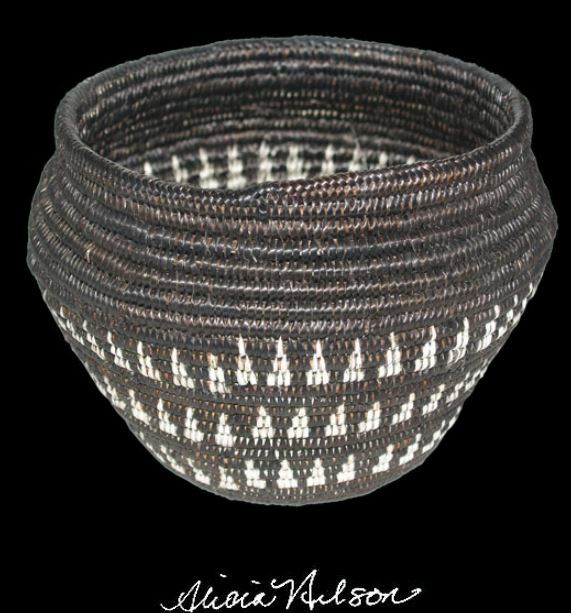 Alicia is one of the best Navajo basket weavers around. Her weave is strong and true, and her symmetry is spot on. In this work, Alicia has depicted a magical place upon a majestic form of the carrying basket. A utility carrying basket is even less frequently seen than the water jar. Tsizis (tsi, hair, and zis, or azis, a bag or pouch, from the mode of carrying it over the hair of the forehead) is used for gathering the hashkan, or yucca fruit, for syrup. The baskets are plaited of willow twigs, the same way our own baskets are, but they don’t have a handle or a finished rim. Instead, a cord is fastened to two of the staves or bows. The basket is carried exactly like the water bottle, but the cord is slipped over the forehead or scalp. At times the baskets were strapped as a pack to a horse or a burro, one basket dangling from either side. A basket of the same type is sometimes made in the fields for carrying yucca fruit. Alicia Nelson took a basket, and its form, and changed it from something to be used daily to an item of immense magic and pleasure. Thank you, Alicia, for your inspired imagination!